To book lessons Tel: 07838 123293 or text "Call back" and your name, and we will call you back. Next 2 Pass driving school offers quality, affordable driving lessons with an excellent first time pass rate. Our Driving Instructors are qualified, friendly, professional and patient. Based in Cramlington, covering Newcastle-Upon-Tyne, North Tyneside and Blyth Valley and surrounding areas. Next 2 Pass offer a range of driving courses including intensive, motorway driving and pass plus. 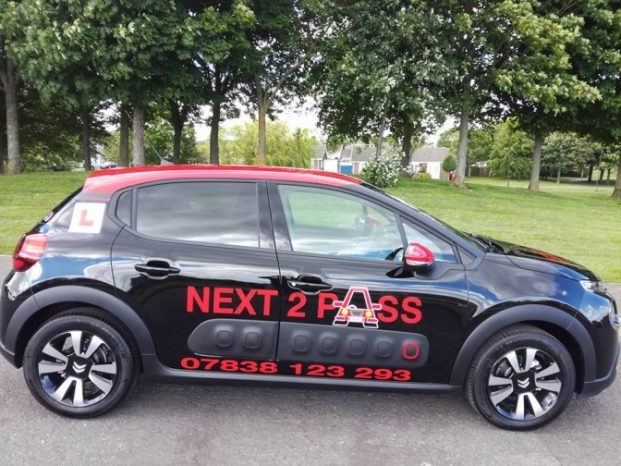 Whether a pupil has already passed a driving test but requires some refresher driving lessons or is a novice driver, Next To Pass can accommodate their needs including drivers who require extended test driving tuition. Next 2 Pass come highly recommended by their current and former pupils. Instructors are flexible with pick up or drop off points and pupils can choose to start or finish their lesson at home, school, college or place of work. The first 2 hours for £30 (beginners deal) offers the opportunity to experience the tuition car and the driving instructor and is a easy affordable way to start learning to drive, this deal is also a great gift to give to family or friends (gift vouchers available). If you wish to leave a review, please click the 'Add Comment' button. Thanks to everyone that has took time to leave a comment. More reviews can also be found on Facebook and Google +. I managed to pass my driving test on the first try with help from Mark. I was very nervous all the way up to my test, but his support made it possible for me to focus and succeed. The value for money of the lessons was great with the amount of information and tips he gives you. Mark is truly a great driving instructor! I couldn't recommend Mark enough! He's kind, patient, funny and what he doesn't know about driving isn't worth knowing. I wouldn't have been able to pass my driving test 1st time today with 3 minors if it wasn't for all of his support throughout my process of learning to drive! I had had quite a few lessons with another driving instructor before I changed to Mark and, to be honest, I don't think I started to learn how to drive until I had lessons with him. My previous lessons has been an hour long and I usually couldn't wait to get out of the car! I was apprehensive about having lessons that were 2 hours long but I had no need to be. I thoroughly enjoyed the lessons and the time flew by. Mark is thorough in his instruction, patient and calm. He is easy to get on with and has good banter so he helps you relax. He does push you out of your comfort zone but this helps build your confidence much more quickly and he never makes you feel stupid if you make a mistake or mess something up. Any criticism is purely constructive aimed to help you become a better driver and pass your driving test. I would recommend Mark as a driving instructor for anyone. Never think you are too old to learn. There maybe reasons, like me, why you didn't learn to drive earlier in your life but that doesn't mean you can't do it now. I am proud to say that I passed my test on my second attempt, the day before my 62nd birthday after about 6 months of lessons with Mark. I don't think I would have done it without him; he's a star! Mark is a friendly instructor who is very flexible even if you live in an awkward place, he gets you through at your own pace and is patient enough to get anyone through. I recommend him to anyone who wants to learn to drive! Mark is an excellent instructor and I don't think I would have passed without him. He's a great guy who keeps the lessons enjoyable while focusing on areas you need to improve to get through your test. Can't recommend him higher and I will be recommending him to anybody in the area that is interested in learning to drive. Well after 7 years I finally did it, today I passed my driving test and I can honestly say I couldn't have done it without the help (and the patients) from Mark Beckford. Everyone will say they had a good instructor but Mark is the best in the business, he is honest and I'm glad I stuck with him throughout this journey. Feeling a little sad that it's come to an end but would definitely recommend him for anyone looking for lessons. Thanks again for all your help!! He is so friendly and makes you feel relaxed, helped me pass first time. THANK YOU MARK!!! Thank you to Mark for helping me pass my test!!! Fantastic driving instructor with lots of experience and knowledge. I would definitely recommend him!! Would definitely reccommend Mark as a driving instructer. Made lessons enjoyable and had a lot of patients! Kept going over things you found hard and gave you confidence. Thank you so much Mark! Would definitely recommend Mark (next2pass) to anyone wanting to learn how to drive. He's really friendly and patient which helps a lot. Couldn't be happier now I have passed. Thank you so much Mark! I came here to say a massive thank you to Mark for helping me pass my driving test. He is a very good driving instructor and I would highly recommend him to anyone that needs to learn to drive. Thank you so much for getting me through this! I passed my driving test first time with a big thanks to Mark. He is an amazing instructor who I would recommend to anyone; all my driving lessons were fun and he always made me laugh and made my time learning to drive an enjoyable experience. Hi, This is a rather delayed comment as I passed back in 2008. Mark was brilliant, had a great laugh and hes very very patient with me. I didnt pass 1st time but this was my issue as I wasnt confident. Mark helped me through and was very helpful and believed in me. I am now recommending my sister for lessons. Brilliant instructor. Passed first time. Good laugh and flexible if you ever need to change lessons or have to re-arrange. Highly recomemded. Cheers Mark. Would totally recommend next2pass! Passed driving test first time and mark is an amazing instructor! Thank you! Just passed my driving test, and need to tell everyone what a great driving instructor Mark is. Made me feel relaxed from day one, I would highly recommend anybody looking to learn to give him a ring. Thanks again Mark. Massive thank you to Mark for getting me through my test first time. Great time in the car learning and talking with you. Will definitely recommend you to anyone looking to learn to drive! Thanks so much Mark! I had a great time learning and Mark is great teacher! I definitely recommend learning to drive with Next 2 Pass. Just wanted to leave a message to say a big thank you to Mark for helping me get through my test on a very tight time limit. I would recommend Mark and Next2Pass to anyone, he was always friendly, relaxed, professional and gave me the confidence i needed to pass. I found Mark through word of mouth. When I looked up this website and saw the good reviews I was skeptical about them, they seemed too good to be true! Mark is my second driving instructor, with 8 hours I was driving around Blyth, compared to being stuck in the industrial estate with the last one. Mark is funny, laid back and intuitive. When I wasn't getting something right, he would find a different way to teach me. Many thanks, Mark for helping me pass first time in such a short time frame. See you soon for my pass plus! Just a quick message to say Thank you so much Mark for being a brilliant instructor, and getting me ready and through my test 1st time with only 1 minor fault! Would Definitley recommend you to others. Thanks again. Chris. THANKS sooo much Mark!! marks been a great instructor ,patient and fun, and i would recommend him to anyone!! Thanks again! Sorry for the lateness of the comment mark you were an awesome driving instructor and pushed me to achieve my best I would definately recommend mark to anyone starting to learn how to drive cheers for everything! Thank you so much to Mark for being such a great instructor and helping me pass my test first time! I would recommend him to anyone learning to drive!! Big thank you to Mark for all his help, he is a great instructor, I would recommend to anyone. Thanks again mark, you have the patience of a saint! Just want to say a massive thank you mark for getting me through my test 1st time. Very patient and funny guy, great to get along with and made me feel at ease. I came up from London especially so I could learn with Mark as he had such a great reputation with my friends and family. Passed first time! He's patient, friendly and overall a great tutor, highly recommend! Big thanks to Mark for helping me pass my test 1st time. Would recommend him to anyone who wants to learn to drive. Great teaching, punctual, professional and a good laugh. THANK YOU! Passed my test 1st time thanks to Mark, would hightly recommend him to anyone thinking of learning to drive, easy to get along with and a really nice guy. I passed first time today with only 2 minor faults thanks to Mark! Mark is a brilliant instructor. He's very patient and he has a really good way of describing and explaining things. My first instructor was crap and put me off driving. After a few reccomendations. I decided to give Mark a ring. Within 10 minutes of my first lesson with Mark I realised just how rubbish my first instructor was! Well worth the money if you want to pass you test first time! Also, Mark isn't one of those instructors who is only interested in you for your money. He genuinely wants you to pass as soon as your ready and I think he said I was ready after my 6th or 7th lesson! Mark always had something to talk about as well, there was never a boring lesson! Finally passed my test. Big thanks to Mark for his patience, professionalism and friendship. My brother and sister both recommended Mark to me as they both managed to pass thier tests with the help of Mark. It's reassuring to have used an instructor that is so good at his job but someone manages to keep a smile on his face. If you're new to driving I can't recommend anyone better as an instructor than Mark. Just like to say big thanks to Mark for getting me threw to my test he is a absolutely brilliant instructor! Mark was an amazing instructor, i wouldnt have wanted anyone else! I would reccomend him to anyone! Mark is a swell guy who got me through my test first time. I had a instructor before Mark and he got me no where, i'd actually recommend him to anyone that asks me about learning to drive. Thanks Mark! A great instructor who got me through my test in 2 weeks. He made it really enjoyable and I'd recommend him to anyone. You're a great teacher Mark and I really appreciate everything. Enjoy the TV!!!! The best instructor ever.. After 9 years of learning with 4 previous (v.bad) instructors Mark got me through my test 1st time and within a few weeks. He must be the only instructor I have ever come across who actually has a personality and a sense of humour! Thanks Mark....you were a life saver. he passed me 1st time, last november but i still aint got a car, might have to retake a few lessons like. very good driving school he got me driving quicker than i expected. Dead canny aswell would advise him to any one..